Hanwell Castle as a building is clearly a shadow of its former self, indeed surrounded by later accretions it is quite difficult to imagine its strictly symmetrical facade (see below) exposing, according to John Goodall's litany, a typical composition of tower, turret, gatehouse, turret, tower (Goodall 2011:362). Indeed some doubt its castle credentials, 'not a castle in the true sense' (Sherwood and Pevsner 1974: 632). However, as we shall see, it is likely such a prestigious building with its remarkable landscaped grounds and its martial trappings would have been viewed as a castle by those who built it and those who came under its sway. The purpose of the project is not to undertake a detailed archaeological or architectural analysis of the castle itself but we need to appreciate the character of and background to the building if we are to afford it its pivotal position in the landscape around it. 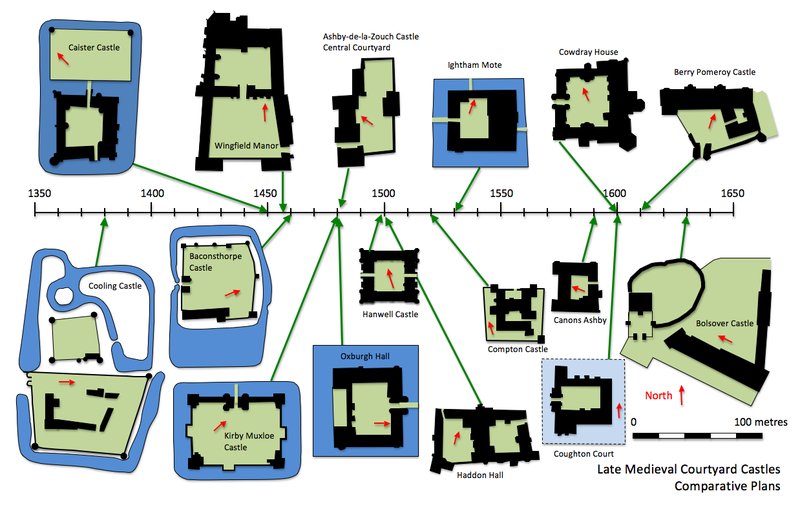 There are a few additional thoughts about the building of castles in the late medieval/ early modern period here. The Victoria County History suggests that the earlier medieval manor was occupied by bailiffs or leased out despite a long line of descent through a number of notable families. The De Vernons held it from the early 12th. century until 1381 when it passed to Sir Richard Abberbury and then in 1415 to the Chaucer family. The redoubtable Alice Chaucer held it from 1436 when it passed through her marriage to William de la Pole in to the hands of the Dukedom of Suffolk until in 1498 it was conveyed to William Cope, treasurer to Henry VII. Interestingly Cope had property nearby, a moated manor just north of Banbury at a place called Hardwick. Irrespective of whether it was tenanted or not the question of the whereabouts of the medieval manor is bound to arise and given the strict symmetry of the castle as built by Cope one wonders if he was applying himself to a 'green field' site and that the earlier manor lay elsewhere. Indeed it is interesting the way in which the road which snakes through the village makes a distinct bend to the northwards around an otherwise empty patch of ground north of the upper pond. Could the original manor have been here slightly closer to the village itself? We will no doubt see at some point. William Cope is credited with at least starting work on the castle, possibly even in 1498 when he took on the property. However, it is clear that the construction was not without its difficulties. William died in 1513 and left his second son Anthony an unfinished building as testified to by a court case of 1518 when William's executors needed the force of the law to ensure the house was, 'finished and made according as it is begun and according to the platt thereof made'. Anthony must have seen the castle to completion as he lived there until his death in 1551, indeed Leland visiting some time around 1540 described it as a 'pleasant and gallant' house rather than a building site. Given the difficulties in finishing the house I wonder if this makes it rather less likely that extensive landscaping of the grounds was undertaken at the same time. The idea of a contemporary flight of fishponds acting as a visual foil to the newly erected castle as per elite landscapes of the period is an attractive one but it is hard to reconcile with a building still unfinished after twenty years or so. Anthony's eldest son Edward was successor but he died in in 1557 and as his son appears to have died before reaching his majority it ended up in the hands of a younger brother another Anthony. Sir Anthony, knighted by Queen Elizabeth and made a baronet in 1611 died in 1614 with debts of over £20,000! 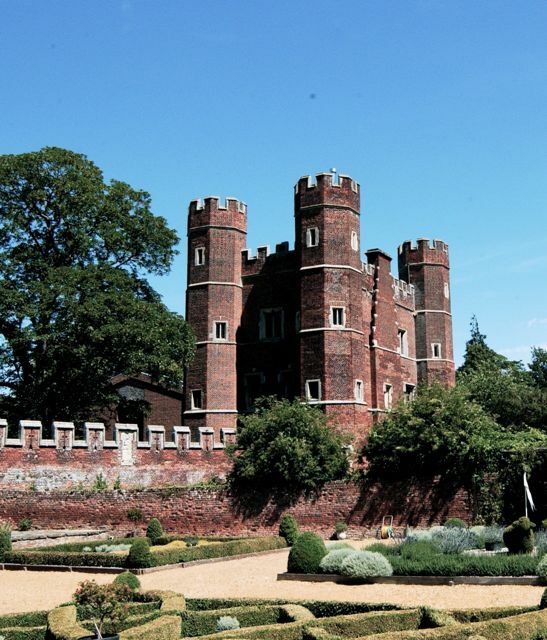 Given that he entertained King James I at Hanwell on two occasions, in 1605 and 1612, a notoriously expensive undertaking, it is not surprising he was in debt and perhaps the scale of his expenditure may have owed something to remodeling the grounds to create a landscape fit for a king. Recovering from such a debt cannot have been easy and the responsibility seems to have fallen to his son William who must have been reasonably solvent as he entertained James I (again) in 1616 and Charles I in 1637 the year in which coincidentally he then died. His son passed away in the following year leaving the property to William's grandson, who was aged 6. His mother, Elizabeth, clearly must have shouldered much of the responsibility for the castle and estate during the Civil War when Parliamentary forces were billeted in the village. 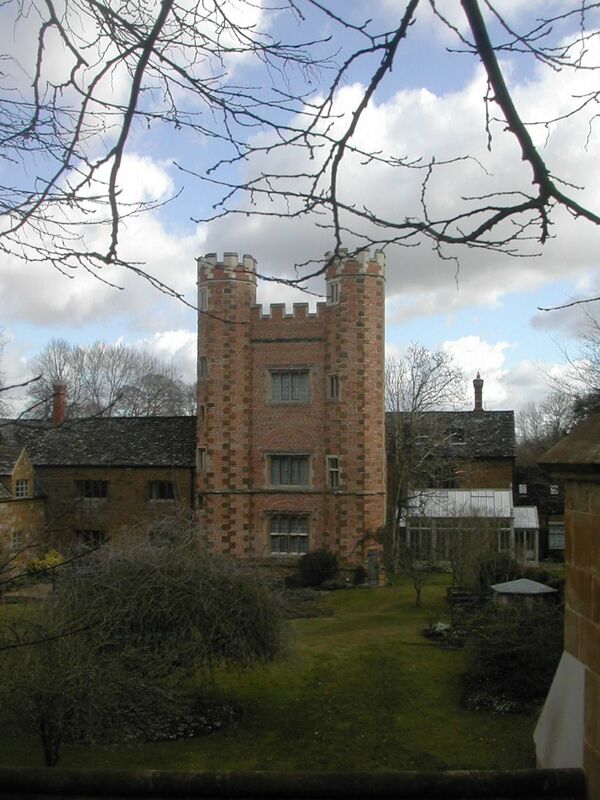 William Waller stayed overnight before the Battle of Cropredy Bridge in June of 1644 (Tennant 1992: 176) and the castle was garrisoned during the attack on Banbury Castle over the following months (Tennant 1992: 189) until the siege was lifted in late October. There was considerable skirmishing in the area as the Royalist relieving force harried the retreating Parliamentarians over the fields towards Hanwell although we have no idea to what extent the castle offered resistance. Indeed have no evidence as to whether or not any additional defensive measures were put in place around the castle. Typically these could involve partial bricking up of large windows, strengthening of doors and the addition of earthwork defences (Harrington 2004: 60 - 79), the latter particularly could have had an impact on the archaeology of the gardens. Whatever the case it appears that Hanwell Castle emerged relatively unscathed by the events of the Civil War possibly as a result of some adroit maneuvering by Elizabeth who may well have played on the family's well known puritan connections whilst Parliament was in the ascent whilst later apparently regaining the favour of the Royalist party by hosting some discussions which contributed towards the restoration of Charles II. After the war Anthony came into his majority and clearly built up his Royalist credentials serving as a member of Parliament for Oxfordshire from 1660 until his death in 1675. There seem to have been no further royal visitations but at some point he was visited and indeed praised by Robert Plot researching his Natural History of Oxfordshire. Plot's account, which is of enormous importance for the study of the gardens, clearly attributes to Sir Anthony much of what he saw commending his ingenuity and great virtuosity so we must assume considerable work was done in and around the 1660s to create such an impression. The question remains, however, as to into what kind of pre-existing landscape Sir Anthony was inserting his wonders. 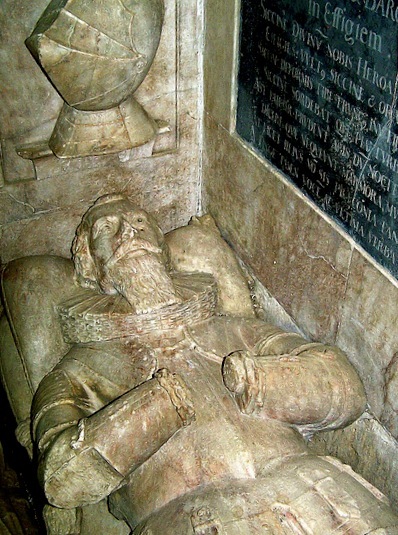 It is interesting in this connection to reflect on the history of the Enstone Marvels, erected by Thomas Bushell between 1628 and 1636; they fell into disrepair during the Civil War but were then restored in 1674 by Edward Henry, earl of Lichfield who added a small island which parallels the arrangement at Hanwell. Following Anthony's death there was a complex chain of events involving premature deaths, questionable wills and insanity which caused ownership of the castle to shift around between various branches of the family. Eventually the manor passed through a female line to the Earl's de la Warr of Pavilion fame. It is not clear at what point the castle ceased to be the main residence of the family. The Victoria County History suggests that following the death of Sir Charles Cope of Bruern in 178l extensive demolition was carried out and the remaining portion converted into a farmhouse with some of the materials being recycled to build appropriate ranges of out buildings. It seems safe to assume that the castle and estate went into something of decline during the late seventeenth and early part of the eighteenth century although the famous water clock was still visible in the mid-eighteenth century. This decline was to small extent reversed when in 1902 George Berkeley and his wife Caroline leased the property and carried out considerable restoration work as well as building a new east wing. Unfortunately some this good work was reversed when the castle became a small private school in 1957. Today the castle, outbuildings and grounds are in multiple ownership. As we have not had an opportunity to undertake a detailed examination of the surviving remains of the castle this account is largely based on The Victoria County History and Sherwood and Pevsner. 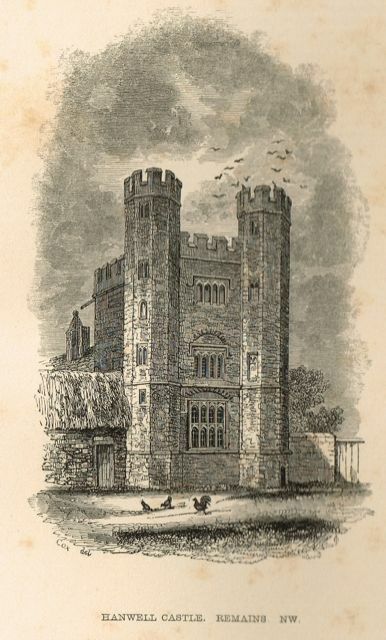 The early engraving reproduced below shows that the castle as built constituted a series of two storey ranges set around a square courtyard with three storey towers at each corner. The V.C. 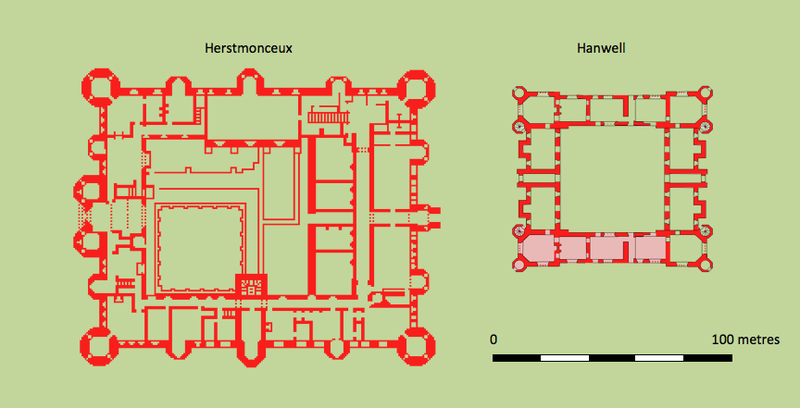 H., on the basis of a plinth on the existing south range, suggests that the complex was actually open to the east. This to some extent is borne out by the early illustration as the towers flanking the east side do not have turrets adjacent to that side. 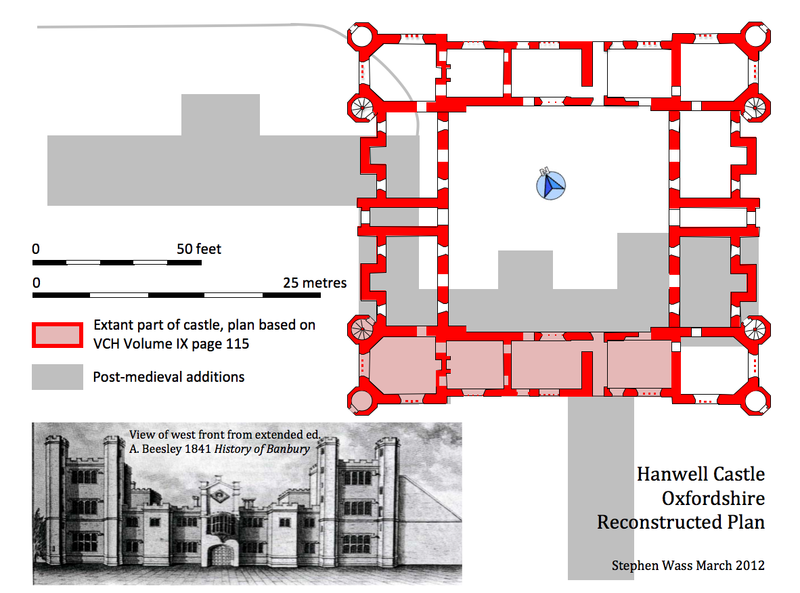 There are of course problems with relying too much on this engraving for details as it is unclear what sources the artist was drawing on for his image and I remain at present more inclined towards the idea of a closed courtyard (See some comparative plans below). As already mentioned Goodall makes much of the 'distinctive rhythm of elements... that was to recur in major English buildings into the late sixteenth century' (Goodall 2011:362) which he suggests was a characteristic of buildings with royal connections or pretensions. At Hanwell the strongly symmetrical west front seems typical of this pattern appearing to comprise of two large square flanking towers with octagonal turrets on the western elevation, two smaller square turrets in intermediate positions and a comparatively restrained central gatehouse with an oriel window below a sculptured plaque which in turn is below a gabled pediment finished off with three square finials. Curiously this exact arrangement is quite hard to find a parallel for. The corner towers in particular appear unique in their particular setting. They resemble on a smaller scale Ralph, Lord Cromwell's great brick tower of 1446 at Tattershall. It is perhaps worth noting that Ralph also figured in the nation's financial affairs as treasurer to Henry VI. Is Cope in some sense sharing in some of the glory of his illustrious predecessor? A closer parallel in terms of date is the tower begun in the 1470s at Buckden in Huntingdonshire by Thomas Rotherham, Bishop of Lincoln but in both cases we are dealing with single towers. Hanwell has four albeit slightly smaller in scale. 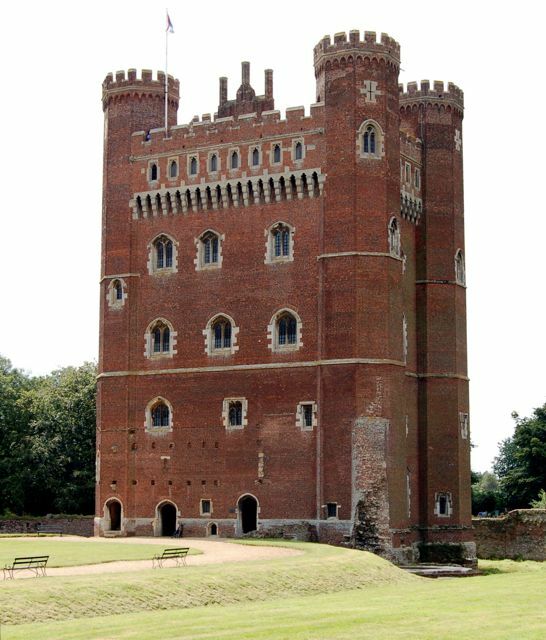 The most common parallel for a tower with octagonal turrets is of course the many late medieval brick gatehouses, starting with Herstmonceaux but running through Hertford (1463), Kirby Muxloe (1480), Esher (1484) to the extravagances of Oxburgh (1482) to name but a few but at Hanwell the gatehouse is under-emphasised and corner towers remain an very unusual and distinctive element in the design. 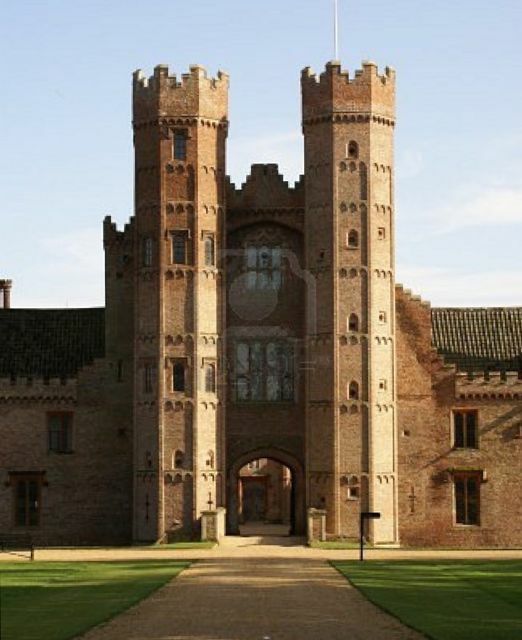 Tattershall, Buckden and Oxburgh - close parallels but not close enough? Clearly at some point the interior would repay much closer study, however, we do now have a clear picture of the importance and status of this building which whilst on a comparatively small scale is modeled to echo earlier elite buildings and to present, at least to the outside world an impressive and quite martial face. Neither, of course, will it do to dismiss the various ancillary buildings clustered around the site. Not only is there likely to be considerable reuse of early materials which could repay study but also the original castle itself must have had outbuildings of various kinds which again may have been incorporated into later work. Finally at some point we will need to pay attention to the church of St. Peter. Not only is it the oldest building on the site, dating back to the 12th. century and having been almost completely rebuilt in the 1340s but it also is a prominent feature of the landscape into which William Cope introduced his castle. the fact that the original approach road ran past the church and that at one point it was actually attached to the castle by a covered gallery indicate that it must be factored in to any account of the castle grounds.